A high-resolution picture will appear below; you can move this window to one side or minimize it, and continue browsing "Belhaven Holiday" while it downloads. The present appearance of this area owes a great deal to the wife of the sixth Earl of Haddington. In 1707 she persuaded him to 'enclose' much of the sandy, salt-blasted Muir of Tyninghame, a rabbit warren north of Belhaven Bay, and plant it with trees. No-one thought they would grow, but they did, and Lord Haddington resolved no longer to 'fight with bad land' but planted with trees everything he could not cultivate. He could make oak trees thrive anywhere - - "on rich, poor, middling, heathy, gravelly, clayey, mossy, spouty and rocky ground, nay, even upon dry sand." Nearly three thousand yards of holly hedges gave protection in all seasons from haar and storm. You can still see some of them by the roadside at Tyninghame, full of berries in winter. Most of the oaks and other trees, alas, were cut down during the second World War, and the ground was replanted after 1945. 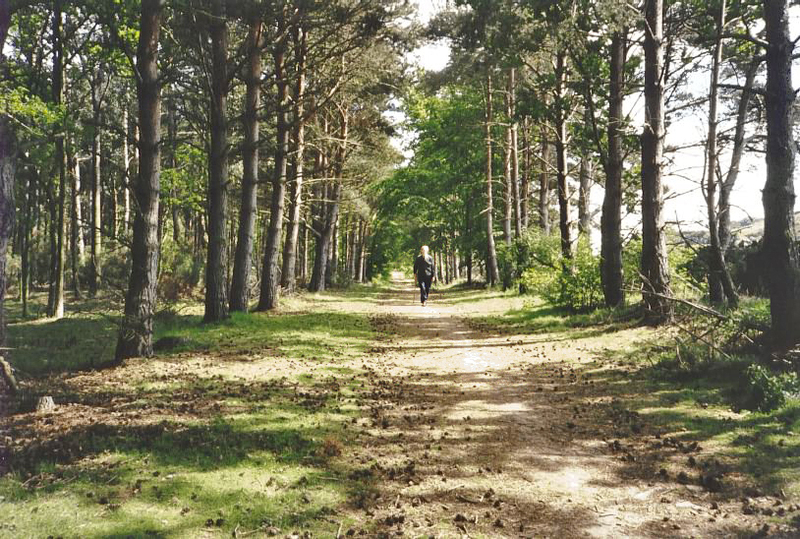 In recent years the Tyninghame Estate has allowed people to walk in the wood west of the road, provided they keep clear of necessary woodland management operations. The local newspapers announce that the Estate has just put the Binning Wood up for sale. The Wood has been sold to a consortium of neighbouring farmers. By the way, 'Lord Binning' is the title given to each Earl of Haddington's eldest son. Just close this window, or minimize it, to go on browsing.